The refreshed and rebranded International Poetry Prize is now open. Wigtown Poetry Prize welcomes entries from poets writing in English wherever you live. Separate categories celebrate the best of Scottish Gaelic and Scots language poetry, a special category acknowledges a rising talent in Dumfries & Galloway, and a new pamphlet prize is named in memory of Alastair Reid – local poet and one of Scotland’s foremost literary figures. 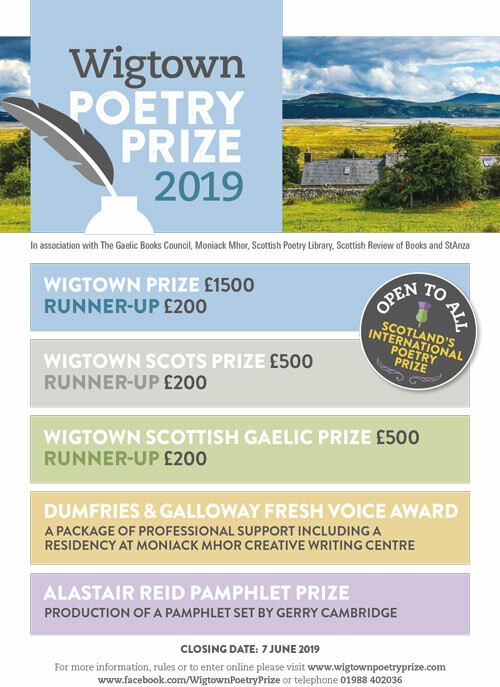 Based in Scotland’s National Book Town for over a decade, Wigtown Poetry Competition has become one of the UK’s best established writing prizes and a launchpad for many writers’ careers. Deadline: Friday 7 June 2019. A prize-giving will be held at Wigtown Book Festival in the autumn. The Gaelic Books Council is recruiting for a full-time Director. GBC is the lead organisation with responsibility for supporting Scottish Gaelic authors and publishers, and for raising the profile and reach of Scottish Gaelic books in Scotland and internationally. The job description is available here. Deadline: Friday 7 September 2018. The Gaelic Books Council is inviting submissions from Gaelic writers for the Donald Meek Award 2018. This award, established with financial assistance from Creative Scotland and Bòrd na Gàidhlig, aims to encourage and support new and established Gaelic writers and new Gaelic writing. Six entries were shortlisted for the Donald Meek Award 2017 and it was bestowed on Iain MacRae for his stage play, Taigh Sheonachain. For more information and rules, see our website. Submissions should be sent via email to rosemary@gaelicbooks.org on or before 5pm on Friday 4th May 2018. The shortlist will be announced early in September and the award will be presented at an evening reception in Glasgow in October 2018. The very best of luck! Tha Comhairle nan Leabhraichean a’ sireadh thagraidhean bho sgrìobhadairean Gàidhlig airson farpais Duais Dhòmhnaill Meek 2018. Chuireadh an duais seo air chois le taic-airgid bho Alba Chruthachail agus bho Bhòrd na Gàidhlig le sùil gum misnich is gun cuidich i sgrìobhadairean Gàidhlig ùra agus stèidhichte. Chaidh sianar ainmeachadh air gèarr-liosta Duais Dhòmhnaill Meek 2017, agus chaidh am prìomh dhuais a bhuileachadh air Iain MacRath airson an dealbh-chluich, Taigh Sheonachain. Gheibhear tuilleadh fiosrachaidh agus riaghailtean an seo. Faodar an sgrìobhadh a chur a-steach gu h-eileagtronaigeach gurosemary@gaelicbooks.org ro 17.00 air Dihaoine 4 Cèitean 2018. Feumar clàr-iarrtais (a gheibhear gu h-ìosal) a chur ris an tagradh. Thèid an geàrr-liosta fhoillseachadh aig toiseach na Sultaine agus thèid na duaisean a thoirt seachad aig tachartas sònraichte ann an Glaschu san Dàmhair 2018. Gur math a thèid leibh!